Add C:\Program Files\NVIDIA Corporation\Installer2 to be removed with "NVIDIA Install Files"
CCleaner currently clears NVIDIA files from C:\NVIDIA but it does not clear other stale installation files from C:\Program Files\NVIDIA Corporation\Installer2. It's easy to accumulate over 1-2GB of old installation files in this directory depending on how often one updates their drivers. 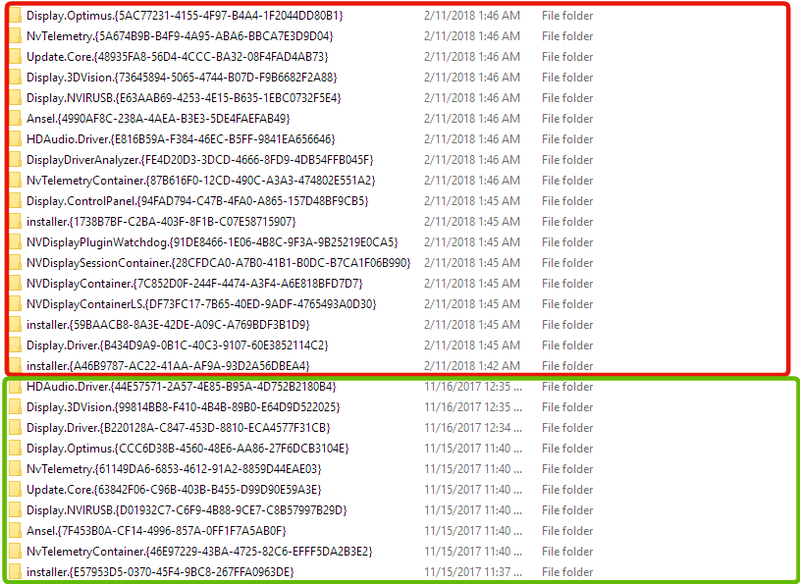 I haven't looked too deep into it, but it appears this folder stores installations of drivers and geforce experience. The only caveat, is that currently installed driver files also reside in this directory so these would somehow have to be excluded from deletion. If you delete the Installer2 folder, you will no longer be able to uninstall the Nvidia software via Control Panel> Programs and Features should you ever need to manually uninstall it. This does NOT mean that you cannot update to a newer release of the Nvidia software when a newer version becomes available. Also, if you have deleted the Installer2 folder, you can re-install the same/current version of your Nvidia software to rebuild the Installer2 folder so that you can use Control>Programs and Features to uninstall should you need to. Personally, following an update of the Nvidia software, I always delete the Installer2 folder because of its horrific size. Have done this for years and years on all my systems and have never encounter an operational issue. This is true if you delete folders from your current driver revision. However, this folder keeps all previous ones as well. NVIDIA does not get rid of them automatically. It's safe to delete those old versions. If you look in my screenshot here you can see the two differently colored boxes I put around the groups of folders within installer2. The red box is from the latest installation (should not be deleted), the green box (safe to delete) is from a previous update that can be removed. You can tell the ones boxed in green are from a previous update due to the repeated naming scheme and the timestamp difference compared to the ones boxed in red. So as I stated in my first post, the caveat for the CCleaner developers would be they would need to systematically determine what can be removed based on duplicate names. For example, you can see in the screenshot that there are duplicates of Display.Driver, HDAudio.Driver, and others just to name a few. The ones with the older timestamp are part of previous revisions and are essentially stale files that are no longer in use.